When I was a little trick-or-treater, I would take the largest pillow case I could find to gather sweet and salty snacks from all the neighbors. Mini bags of cheese puffs and salty potato chips mixed in with chocolates and hard tack candy, chocolate coated crispies, toffee, and marshmallow, would make my pillow case hard to carry by the end of the night. Halloween is still a fun time of year, for both kids and adults. For a “trick” — change your identity with a flick of a mask, or for a “treat” splurge on sweet, salty, and spooky boozy drinks for the grown-up ghouls. Here is my skinny spooky line-up of Halloween treats that are tasty but not scary for your waistline. Homemade Sweets for Kids and Adults: Kids are tough critics, and most kids clamor for the sweet stuff. Try this selection of “not-so-sweet” goodies for your kids’ parties and other fall festivities. 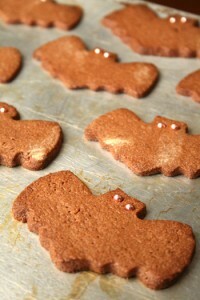 Coco bats are sweet-looking, chocolate sugar cookie cut-out that contain whole wheat flour and half the amount of sugar compared to traditional recipes. Fast, no-bake coconut banana bites are perfect for hosting an impromptu Halloween party. Kids think the coconut crust is made from cookies, but I serve them because I love the flavor combo and they are low-cal. If you’re in the mood to bake, try this low-sugar, soft Pumpkin Peanut Butter Cookies made with canned pumpkin and protein-rich peanut butter. Pumpkin Chocolate Bread Pudding is a great post-meal treat that uses vitamin A-rich canned pumpkin. 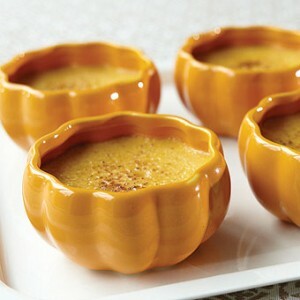 To make it more kid-friendly, bake it in small individual ramekins, or bake in these adorable pumpkin ramekins that you can also reuse for Thanksgiving. Grown-up Trick or Treat, Chocolate Covered Superfoods: Dark chocolate-covered anything tastes great! I recently came across this amazing company, Organic Traditions, and sampled their vast line of superfoods. 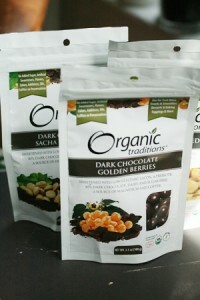 I tried these unique chocolate-covered superfoods, that are extremely low in sugar, only 1-2 grams per serving and made with South American superfoods, like sacha inchi seeds that are high in omega-3’a and golden berries, a sweet tart chocolate berry, high in fiber and containing other nutrients like iron. They taste similar to a dried gooseberry and are perfect for anyone who loves sweet tarts. These chocolate-covered goodies are dairy free, and sweetened with Yacon, a sweetener made from a root indigenous to the Andes of Peru and Bolivia. It contains fructo-oligosaccharides — a type of dietary sugar that the body does not metabolize — and also contains bifidus bacteria, a probiotic bacteria. More Dark and Devilish Chocolate: Everyone I know loves chocolate, including me, but not all chocolate bars are created equally. My bar of choice, Ginger Green and Black’s has bits of crunchy crystallized ginger and is high in real antioxidant cocoa which you won’t find in most of those phony milk chocolate bars you’ll see in the candy isle. Six substantial squares of this indulgence are only 100 calories. Pretty sweet if you ask me! In the mood for more chocolate? Try my recipe for chocolate sorbet flavored with coriander and cinnamon. If you’re a fan of salty, tangy and spicy — here’s a snack line-up that you’ll enjoy, with ingredients that have more to offer than your run-of-the-mill potato chips. All three options are made from superfoods: seaweed, kale, and almonds, so crunch away and feel free to mix and match at your next creepy cocktail party! Seaweed Snacks: Sushi lovers will cherish these seaweed snacks that are made from dried seaweed wrappers they used to make sushi rolls, only these crisp sheets are thinner and flavored with wonderful seasonings like sesame, wasabi, and chipotle. Sea vegetables are extremely low in calories, sugar-free, low in fat, a good source of iron and vitamin C (which helps iron uptake). They’re also a great source of minerals that most people lack, such as iodine that’s important for making thyroid hormones. 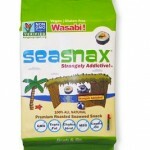 Seasnax is my favorite brand, and I’ve tasted every flavor. The most addictive flavor is the wasabi, true to its name it tingles your taste buds and tickles your nasal passages — a must-have Halloween treat for anyone who loves spicy. 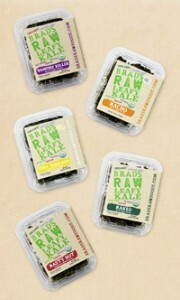 Kale Chips: Kale is one of my top superfoods that I eat daily in smoothies, soups, noodle dishes and many other ways. Kale chips are all the rage now, and they are a healthy and tasty substitution for salty snacks. Most of the kale chips I’ve tasted on the market taste decent but here is one of my top two picks: Brad’s Nacho kale chips are cheesy deliciousness made with a vegan cheese that tastes just like real dairy! The chips also come in large crisp clusters of kale and break apart wonderfully in your mouth as you crunch. Tangy, Zesty Almonds: Everyone knows that almonds are a nutty delicious superfood. And like olive oil and avocados, almonds have been proven to help stave off heart disease and diabetes and to help lower bad cholesterol. They are also high in vitamin E and magnesium, which improves blood flow and calms arteries, crucial for healthy hearts. Keep the skin on to get double the amount of antioxidants compared to the blanched variety! But plain almonds can get boring. Try any one of these Bold Flavors by Diamond Almonds, including Lime and Chili, Jalapeno Smokehouse, Honey Dijon, and many other zesty flavors! Their new coffee almond line is ideal for busy adults on the go — coffee and almonds are a natural flavor pair, two of my favorite superfoods in one high-protein snack! I’m intrigued by the caramel macchiato flavor…. This green goblin shot gets a citrusy boost from lime. 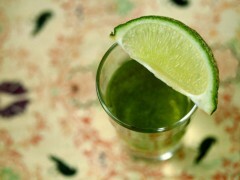 If you like a lemon drop, you’ll enjoy this ghoulishly green shot made with fresh lime juice and just a pinch of sugar. Chartreuse is the base, a herbacilous liquor that has a natural green color, with no added food coloring. A homemade Bloody Mary with freshly grated horseradish remains one of my favorite drinks, it’s naturally low-carb and low sugar, and I just love the zing horseradish and hot sauce give this tomato-flavored classic. To save further on calories, scale slightly back on vodka. On Halloween night, during the witching hour, be choosy when you pick your poison, always drink in moderation to be safe. When it comes to trying new mixed drinks or shots, try splitting your drink in half to share with a friend since the sweet stuff does go down easy! You’ll save on calories and avoid that “post party” headache.